I like lunchtimes. 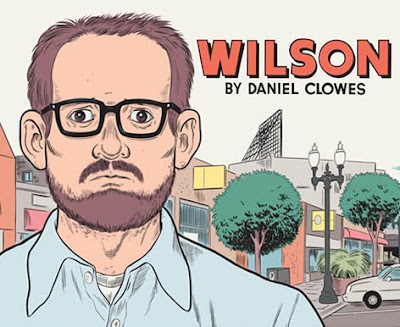 A small midday wander around the block to clear my head this week led to the surprise discovery that Daniel Clowes has released a new graphic novel. Within ten minutes I was walking out of a nearby bookshop with a brown paper bag full of beauty and strangeness bound together under the name of the latest Clowes anti-hero, Wilson. I think you need time for Clowes work to sink in (you can read some reviews here at the Drawn and Quartley website) but so far so great. Wilson is a continuous story in a similar vein to Ghostworld and David Boring but eschews their chapter format for a series of page-sized self-contained scenes of six panels. Each page has been beautifully drawn in a different style, each recognisably Clowes, but varied enough that they draw your attention to different elements of the story. Wilson himself is a balding middle-aged American who (thanks to his dying father) recognises that his best days are probably behind him. Blessed with the usual Clowes-character misanthropy, he sets out on a journey into his past to follow up on his couldas, wouldas and shouldas. This leads to encounters with his down-at-heel ex-wife (and the daughter she put up for adoption after their split) with unexpectedly harsh consequences. Despite some improbably nasty displays of disgust towards the general public, Wilson’s bitter, self-righteousness is easy to believe. Curiously it was made more tangible by an interview I’d read earlier that day with the eerily similar-looking Mark “E” Everett (from the Eels*). Both Wilson and Everett seem to share similar disdain for modern mores (one memorably poignant scene sees Wilson struggling against his inner Luddite by using Skype for the first time) as well as bushy beards. 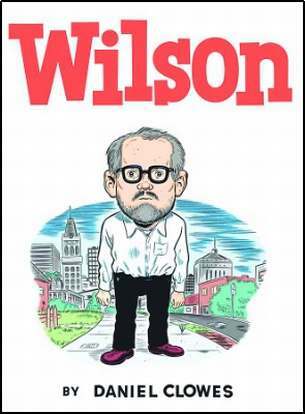 Wilson is perhaps Clowes most linear and uncomplicated long-form work since Ghostworld. Whilst keeping up his trademark mistakes, misshapes and misfits worldview, it contains little of the savage weirdness of Like a Velvet Glove Cast in Iron or the dark paranoia and sexual dysfunction David Boring. As such it’s a great place to start for newcomers to Daniel Clowes although bear in mind this is a bit like saying you should watch Blue Velvet before Lost Highway. * as an aside the cover art to Eels new album End Times features a Clowes-eque portrait, actually done by Clowes’ Drawn and Quartley label-mate Adrian Tomine.